Oliver Wolcott (December 1, 1726 – December 1, 1797) is an American Founding Father. He was a graduate of Yale College, a Captain during the French and Indian War and Sheriff of Litchfield County. Oliver Wolcott would become Brigadier General of the entire Connecticut force, under command of the Continental Armies. 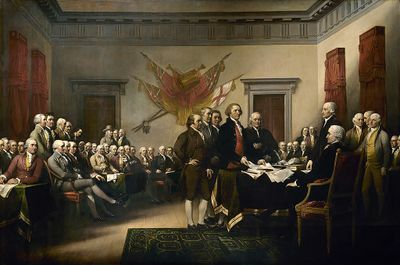 He was a delegate to the Continental Congress from Connecticut that signed the Declaration of Independence. Also a Lt. Governor and the Governor of Connecticut. Oliver Wolcott was the youngest of fourteen children of then Royal Governor Roger Wolcott. During his graduate year at Yale College 1747, Oliver would be appointed Captain by the Governor of New York. He would organize an all volunteer militia and be sent to the Western frontier. When Wolcott returned he would pursue a study in medicine until appointed Sheriff. In 1755, he was married to a Miss Laura Collins and they had several sons and daughters. His son Oliver, Jr. would also be Governor of Connecticut as well as Secretary of the Treasury under Presidents George Washington and John Adams. During the course of war, he would become Brigadier General of the entire Connecticut force, commanding fourteen regiments of the state militia for the defense of New York. Wolcott assisted General Gates in the memorable defeat of the British army under General Burgoyne. Wolcott served Congress until 1784 and then retired. In 1786 he was elected Lieutenant Governor. In 1796 he was elected Governor of Connecticut, a position he held until his death at age seventy-one. Born and died on December 1, he is buried at the East Cemetery in Litchfield. This page was last modified on 26 June 2016, at 22:43.